Who says healthy food that tastes great has to be complicated? Let me tell you, it doesn’t! Most times it’s the simple things that are the best, really! This baked potato is the ultimate proof. It’s one of my favorite recipes and at the same time, one of the easiest. I just place the potato in the oven and let it do it’s job. Btw this works really well without aluminum foil (which you should avoid in combination with hot food anyway). 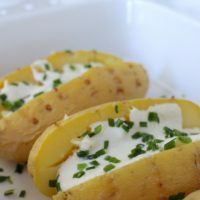 As soon as it’s done, I spread some of my Sour Cream on the potato and sprinkle some herbs and chili on top. Yap, it’s that simple! It does take a while for the potato to cook, I grant, but I can make use of the time while the oven does all the work by itself. If I happen to be really hungry already, I just use the time for eating some salad or something alike. 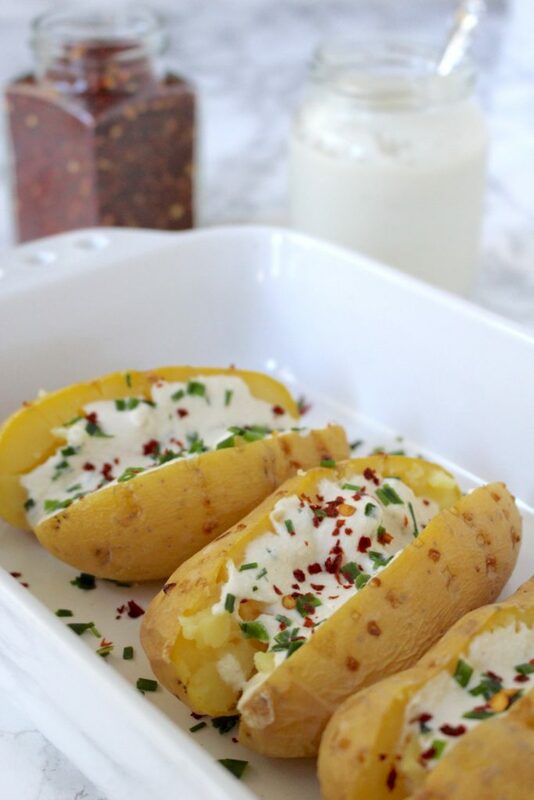 The baked potato can also be grilled. As it will take a few minutes, you can bridge the waiting time with the preparation of other delicious grilled specialities. Btw, in case you didn’t prepare the sour cream in advance, the best time to do so is while the potato is baking. Just soak the cashews in hot water, using the fast method and by the time your baked potato is done, you can just blend all the ingredients together. It doesn’t get easier than that! I could eat potatoes all day, every day (and to be honest, I probably do eat them every day). This is why I bake a few potatoes at the same time so that I always have some on hand which I then add to different dishes. Again, it doesn’t get any easier than that! Healthy and at the same time tasty food doesn't need to be complicated. 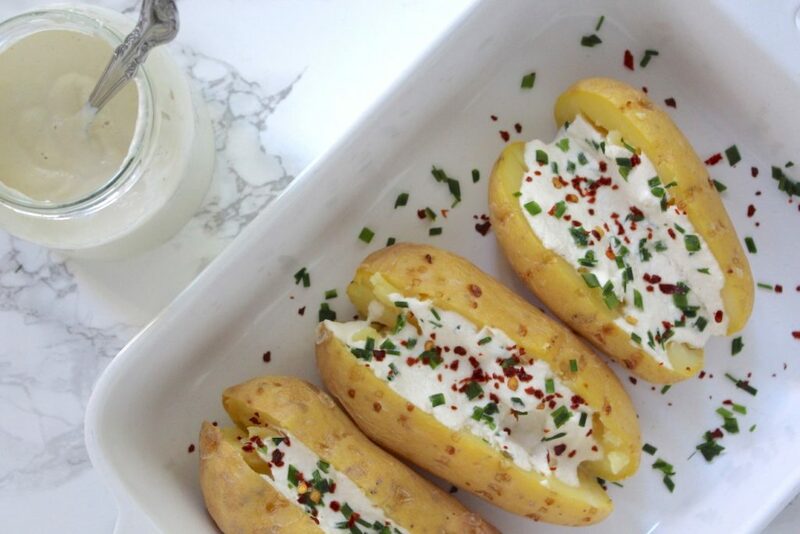 This recipe for baked potato is the ultimate proof. Making these on the grill also works really well. Preheat the oven to 430 °F (circulating air). 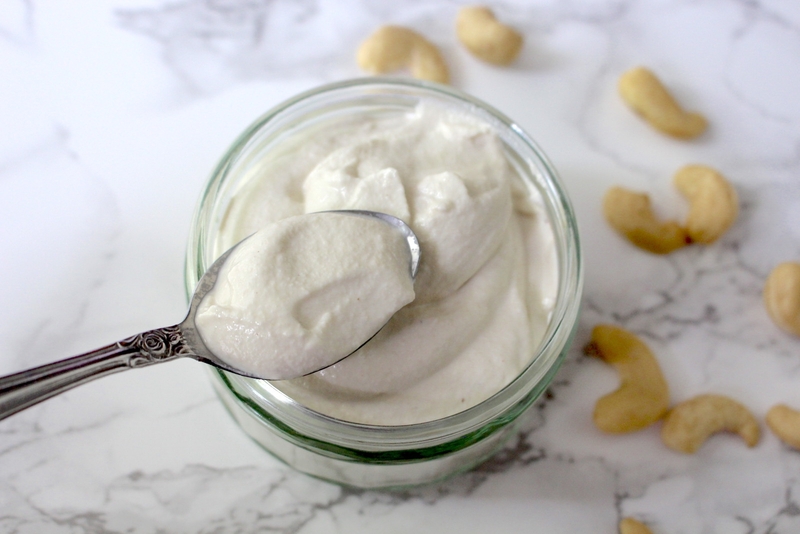 If sour cream isn't prepared already, start by soaking cashews in hot water and set aside (search for "Sour Cream" on this blog for the full recipe, or click the links in the text above). Clean Potatoes and pierce upper side with a fork a few times so that the steam inside the potato can escape. Place directly onto oven rack and bake for 45-60 minutes until soft inside. Prepare sour cream, if not yet done, shortly before the potatoes are cooked. 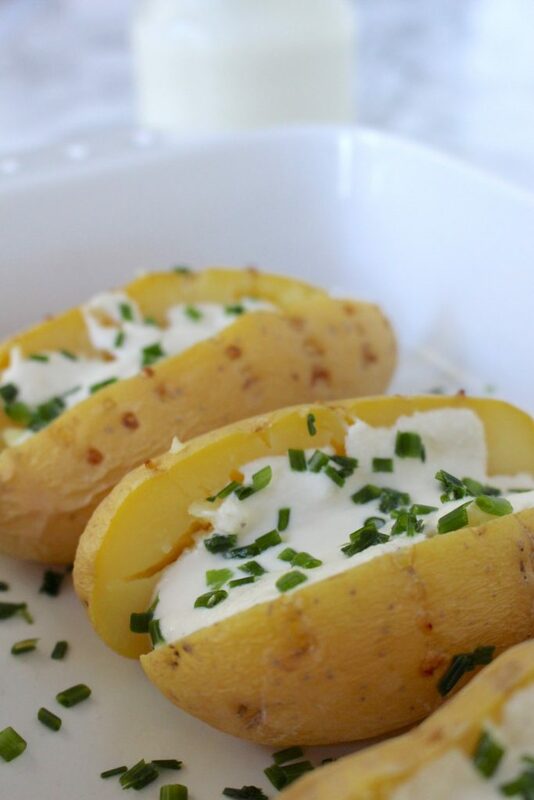 Let potatoes cool for a few minutes before cutting them open lengthways. Add some sour cream, herbs, chili flakes, salt & pepper to taste before serving. 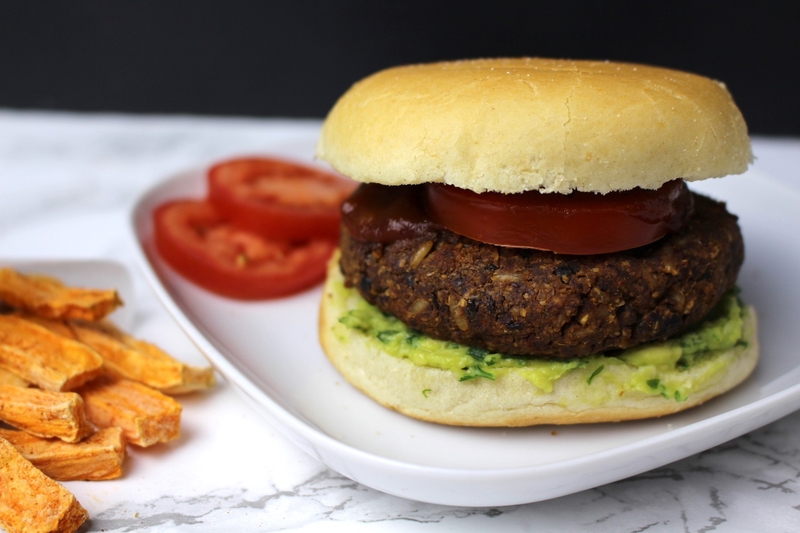 I hope you love the recipe – please let me know in the comment section below! Share your remakes on my Facebook page or on Instagram, using the hashtag #minamadefood and be sure to tag me (@thisisminamade) so that I can see your creations!